Ski Storage Racks - Get Them Off the Ground! Does your entire family ski or snowboard? If so, do you find a huge clump of them on your garage or basement floor? Or maybe you have cross country as well as downhill and then there is that snowboard! Not only can they be damaged, but you need a system that is easy to use between skiing trips and also for off season so that they are ready as soon as that snow flies. If you are trying to organize your garage or basement, sports equipment can quickly get out of hand. But at least with skis, if you get the right rack, they can be quickly stored on the wall and off the floor. If everything has its place then you can get organized! This is a neat and easy way to get them organized and vertical. Lets the snow and ice drip off and they stay together in pairs. This one also houses the poles and keeps them safe. 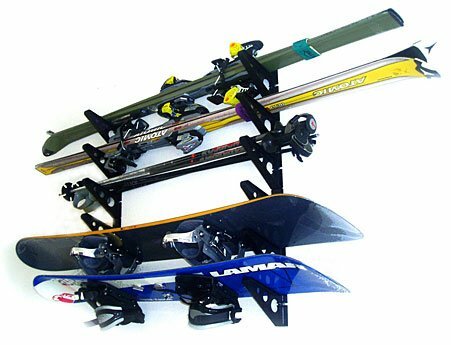 If you need to store both skis and snowboards safely, you can get this combination rack that gets them all off the floor. 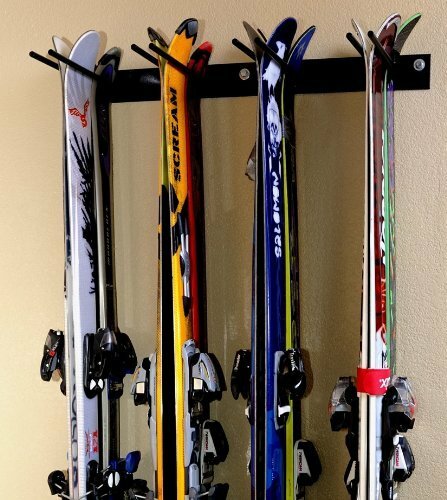 If you have a lot of skis and boards you may need to get a couple of these racks. They are an affordable way to get this equipment off the floor. They are easy to get to, so they can stay on this rack even during the season and then can be stored in the same rack off season. If you have products that are easy to use, chances are they will get used! Leaning them all against the wall is a bad idea, they usually get knocked over and using a vertical wall rack utilizes wall space, especially in the garage or basement. If you have a sports loving family, equipment can get seriously out of hand. It is very expensive to purchase these pieces, so for the sake of a few racks on the wall and strict instructions to put them in the rack, they will stay safe and not take over the place.! Bicycles are another bit of equipment that can get out of hand. If you are trying to reclaim your garage floor check out these bicycles racks too.